The Cross on the shores of the St. John River in St. David, Maine (near Madawaska), has received, in recent past, quite a bit of attention! Every year, during the Acadian Festival, events are centered at the Cross. 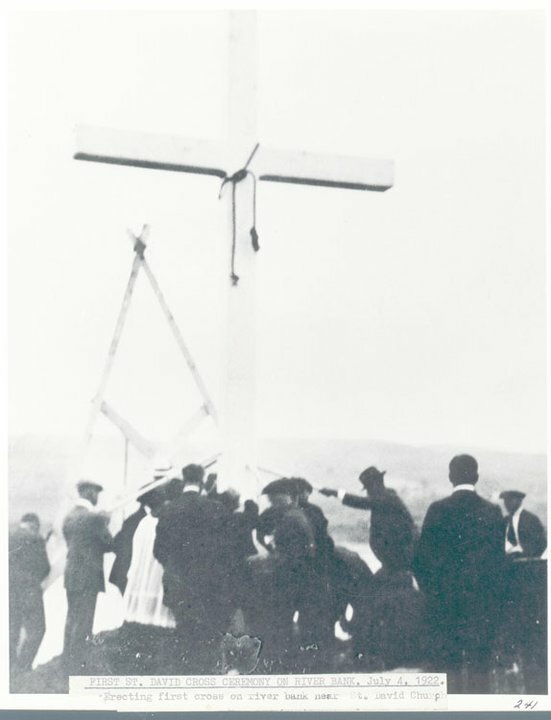 In 1980, the DAIGLE family reunion held a ceremony in which the Cross, which had been at the site for a number of years, was replaced. Time and weather had taken its toll. Because of the rotting wood, the Cross had fallen ever. 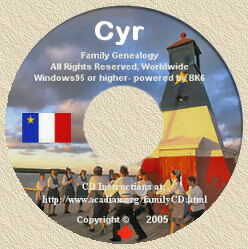 Tradition and history tell us that the first Cross had been erected by the leader(s) of the original Acadian settlers. It was fitting that the descendants of Joseph Simon DAIGLE replace it during their reunion. Joseph Simon DAIGLE directed the erecting of the first Cross in June 1785, upon setting foot on the banks of the river at St. David. Thus, the two DAIGLES, six CYRS, one THIBODEAU, two MERCURES, one SANSFAÇON, one AYOTTE, one POTIER, one DUPERRE and one FOURNIER...sixteen original settlers, had expressed their faith in God and in the new land. Today, it is referred to as "The Acadian Cross", "The Landing Site" and "Cross on the Flats". The Cross and the Cross site is used as a point of reference, from which all Acadian history in the St. John Valley, starts. This is the symbol by which the arrival of the deported settlers, is marked. It is probably very fitting that the Cross be the mark for the event, for there exists no other mark or symbol that would accurately represent the spirit of the new arrivals. If we look back on history to the happenings and events that preceded the erecting of a cross by the settlers, it may be possible to acquire an insight as to why the Acadians erected a cross and what it must have meant to them. The deportation of the Acadians by Governor Lawrence, took place in 1755. The erection of a cross in St. David, took place in 1785...a span of thirty years! Thirty years in which a people were on the move, never acquiring a permanent home or community, and deprived of all accepted norms by which people live...no school, no church and no organized community. Children born after the deportation, some now at age thirty, never received any education, or religious training. The only knowledge acquired was from what parents, with their limited schooling, could pass on to their children. So, they arrived in St. David as a God-fearing people, generally illiterate, with very limited worldly possessions, and an ardent faith in their newly acquired land grants. The Bible's rendering of what happened to Our Lord on the Cross has been the accepted symbol of Christians since His passing on earth. A happening of profound consequences when an innocent Christ is crucified by higher political powers. Here was a happening our ancestors could associate with. An event that moves the human senses. Once learned, the message is not forgotten. As meager as their knowledge may have been, they were positive as to what the Cross meant. Having deprived of organized churches and on those few occasions when they may have been able to attend mass, the language of the mass was in Latin, a language not understood by our ancestors. They could see the movement of a priest as he went about at the alter, but we can safely assume that very few understood the meaning and symbols of the mass. The Cross remained for them the most comfortable and understood link to their Go. At the foot of this Cross, they could kneel and express their faith in the newly acquired land and pray that they could maintain a livelihood for their families. If the family lost a child, or a loved one by sickness or accident, here they could kick in the dirt and ask "Why have we been so severely treated?" During such difficult periods with no professional medical help available and all home remedies and treatments exhausted; the only comfort left was going to the foot of the Cross to implore a loving God for good health to the loved ones. Likewise, frustrations or other short comings of human nature, was confided and left to divine guidance through the intermediary of the Cross. Later generations would set up road side shrines in remembrance of special events and tragedies where traveler could stop, offer a prayer of thanksgiving and continue on their journey. Some of these road side shrines, with a Cross as a central figure, are still evident along the roads of the St. John Valley, mostly in the state of abandon and unkempt appearance. The passing of time has weakened the position that the cross once occupied in the lives of our ancestors. Those who attended the DAIGLE and CYR reunions in 1980-81, those who attended an open-air Mass at the site of the "Acadian Cross", could not help but have felt the message that our ancestors were trying to convey when they erected their first cross on the banks of the St. John River. At no time could you have felt closer to these brave and devout people who were our Acadian ancestors. In the manner that the later road-side shrine placed along the highways were a family's mark of a special event and meant to be remembered, our ancestors placed their shrine on the banks of the river where the coming and going of river travelers could observe that here existed people who had marked their special event. Here lived a God loving people, who, as a symbol of new hope in their first actions upon settling in this valley, had made their mark in the annals of mankind in the form of a Cross. The Madawaska Historical Society has long recognized the meaning of the Cross in St. David. Under the leadership of the Historical Society and interested individuals, an attempt is being made to resurrect the site as a memorial to all Acadians whose ancestors passed through the St. John Valley. A fund has been started for a meaningful and permanent shrine. The support for this endeavour is progressing with the help of the generous citizens of the town of Madawaska (Maine) and appropriate engineering plans being prepared to create a worthy remembrance.. Future generations should have a significant sign of their Acadian Heritage. It is the obligation of our generation to insure that this permanent symbol be passed on and thus insure that the message of our ancestors is passed on to future generation, forever!